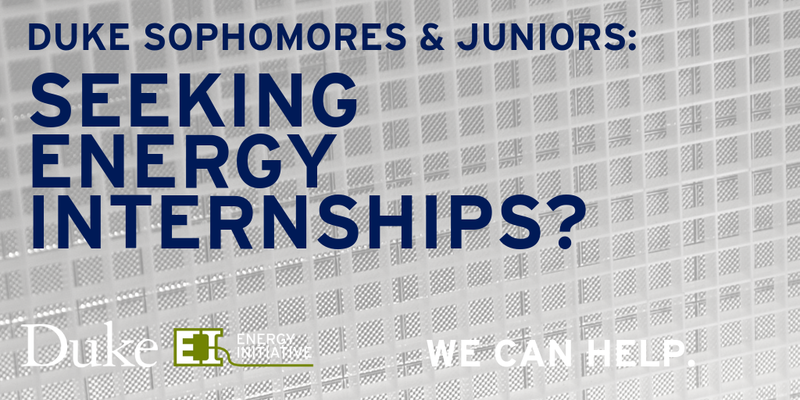 Are you a current Duke sophomore or junior seeking an energy internship for summer 2019? The Duke University Energy Initiative is maintaining a list of energy companies interested in internship applications from Duke sophomores and juniors. We encourage you to reach out to any that appeal to you—and check the list regularly, since we will be adding more in the weeks to come! We invite current sophomores and juniors to apply for supplementary financial assistance for selected unpaid or low-paid opportunities on this list. We strongly recommend applying ASAP, as we’ll be reviewing applications on a rolling basis. We will accept financial assistance applications until April 15 or until all funds are committed. Contact Stacy Peterson (stacy.peterson@duke.edu or 919-684-1394), assistant director of alumni and student engagement at the Energy Initiative. The Duke Career Center is an excellent source of advice on interviewing and other career development skills and has information about other potential programs. Join the Energy Initiative’s email list to receive weekly updates on energy events and opportunities for Duke students. To inform Duke students about your company’s summer 2019 energy internship listing(s), contact Stacy Peterson (stacy.peterson@duke.edu or 919-684-1394), assistant director of alumni and student engagement at the Energy Initiative.